Sapwood is the area of wood just underneath the bark. Heartwood is the area inside this. In the photo above you can clearly see the ring of sapwood surrounding the heartwood. In many trees sapwood is a different colour and has quite different properties. 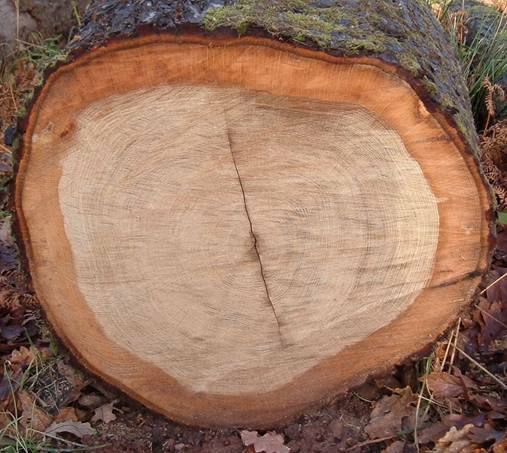 For instance with oak it is a slightly lighter colour (when dry) and will rot if allowed to stay wet. So if you are constructing something that will be exposed to the elements such as a garden structure, you should not use any sapwood. On the other hand most beams used inside buildings where they will not get wet do include sapwood. Some woods do not have the same distinction between heartwood and sapwood. For instance ash is pretty much all sapwood and it is this wood that is a useful wood. Much oak that is available contains a lot of sapwood. If a piece of oak is described as having waney edge, or only two or three square edges it will contain much sapwood as there is always a ring of sapwood below the bark. At Boatbuilding Timber Supplies we always find out whether a customer wishes to allow sapwood.